This sauce was inspired by Thai and Vietnamese flavors. It is very easy to prepare and perfect for tweaking to not only your taste but also your heat tolerance. The recipe is for a small batch for two servings but you can quickly, and easily, double or even triple the ingredients. This zesty sauce has amazing fresh flavors that are slightly tart, sweet, gingery and definitely spicy. You may use it for dipping fresh spring rolls into it, for marinading either poultry or seafood, or also as a condiment for grilled meat and fishes. Go on give it a try, you'll love the burst of flavors. Take the little bowl and into it pour the fresh lime juice, the honey, the oil, fish sauce and a splash of soy sauce. Give the ingredients a good stir then set the bowl aside. Peel the garlic and finely mince it either with a knife or with a garlic press, then add it to the bowl with the other ingredients and mix it until well combined. Now use a spoon to peel the skin off from the ginger, if you need a further guide take a look at these instructions. Use the finest side of the box grater (the side with the smallest holes) to grate the peeled ginger. Grate until you have the teaspoon then place it in the bowl and again mix the ingredients well. Chop the chile pepper and for a spicier sauce include the seeds, but for a milder version discard them. Add the chopped pepper bits into the bowl and stir. Next, chop a very small handful of fresh cilantro leaves and add them to the bowl, mix and try to combine everything as best as possible. Allow the sauce to sit on the counter for a minimum of 10 minutes. If you'd like you may also allow the sauce to sit overnight and use the next day but for this cover the bowl and place in the refrigerator. After the 10 minutes, or overnight, taste the sauce and see if it is to your taste or if it needs tweaking. You may at this time also want to think about what you'll be using it on and if you should add more soy sauce. 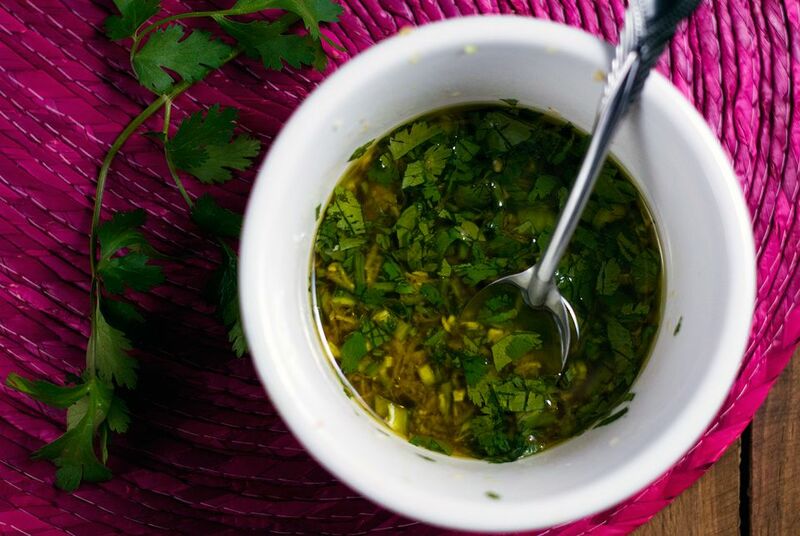 Using lime is imperative as this is an important flavor for the sauce that is inspired by Thai cuisine. If you use lemons you will end up with a, still delicious, but completely different flavor.